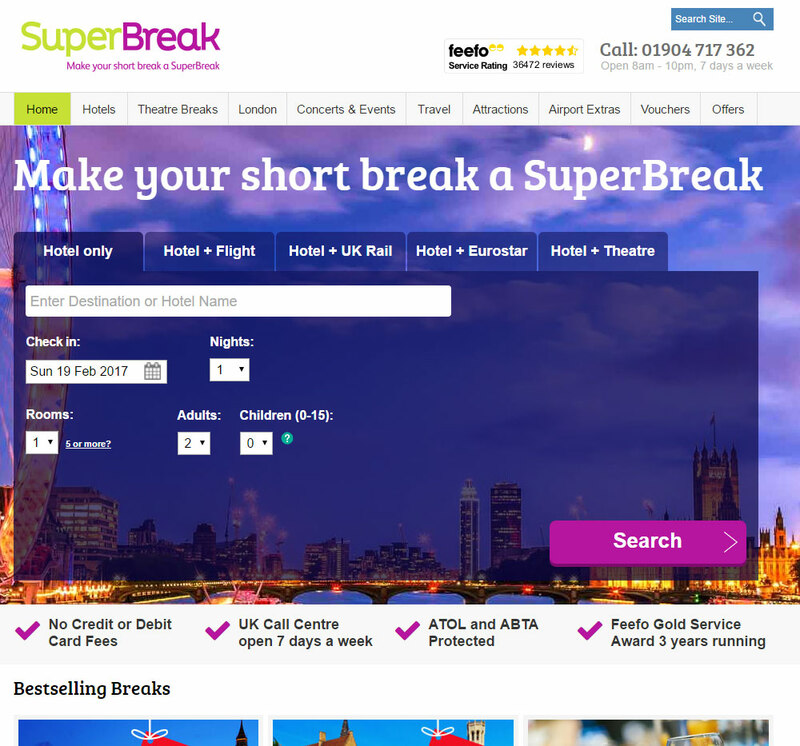 Improving reassurance messaging on the SuperBreak homepage, resulting in a +5.8% conversion rate uplift. Reassurance has always been a key factor in web design. When I got my first Web Design job at EmpireDirect.co.uk in 2005, websites used a little lock symbol, usually adorned with ‘Secure Website’. People were nervous of using websites so reassurance was important. It’s easy to forget that people can still be nervous of using a website as we’re all far more familiar with the internet than we were over 10 years ago. Yet website security is probably as big an issue as it has ever been and trust is an instinctive part of human nature. Research showed that SuperBreak has a low brand awareness and also a high percentage of new visitors, compared to return. The homepage is one of the highest traffic pages on the website and is naturally a page where users may seek information about a company or form their initial impressions. SuperBreak therefore has to work harder to reassure customers who haven’t heard of them before that they are trust worthy and to also inform users of some of their unique selling points, in a highly competitive market. Previous tests and research also showed that the fact SuperBreak has a call centre, appealed to customers and influences online conversion. I have also previously tested the display of ‘No Credit or Debit Card Fees’ on SuperBreak’s mobile review and add screen which had a positive effect on conversion. In usability testing, this message also often appealed to customers, always getting a very positive response. SuperBreak has a very high Feefo score and has gained a Gold Service Award every year since joining Feefo – a company that gathers independent reviews of customer’s experience with the company after their break. 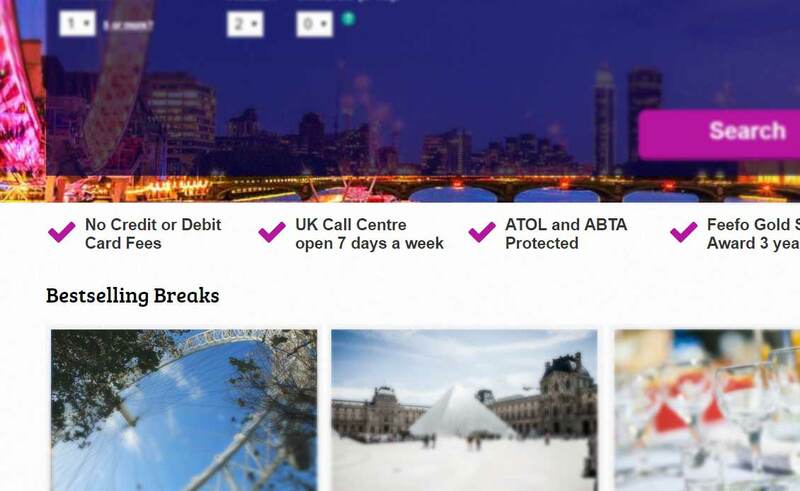 SuperBreak is also a member of ATOL and ABTA, accreditations that give customers more security and protection when booking holidays and short breaks. Having worked at SuperBreak for some time, these things are general knowledge to me, so were relatively easy to think of. The hypothesis seemed quite strong but still I wanted to test the impact of the change because adding content in a prominent position on a page shifts interaction which can affect conversion. We also considered using icons instead of ticks. I however felt that the icons added cognitive load, making the area harder to absorb than the uniform tick display. We decided that this could make for a good follow up test to determine which was most effective. The content needed to be positioned in line with its importance, relative to the rest of the page content and functions. Placing it below the search form which is the primary function of the page gave the top section of the page a natural flow and would also help ensure that a large proportion of users would see the content – given that the majority of users search and don’t scroll that far down the page, having looked at heatmaps in Hotjar and measuring interactions with page elements in previous AB tests. The test finished positively, increasing conversions by 5.8% and revenue per visitor by over 10%. Given the change was simple yet produced a large return, the return on investment is significant. Learnings from the test can be taken forward to further test increased reassurance & unique selling point content around the website.